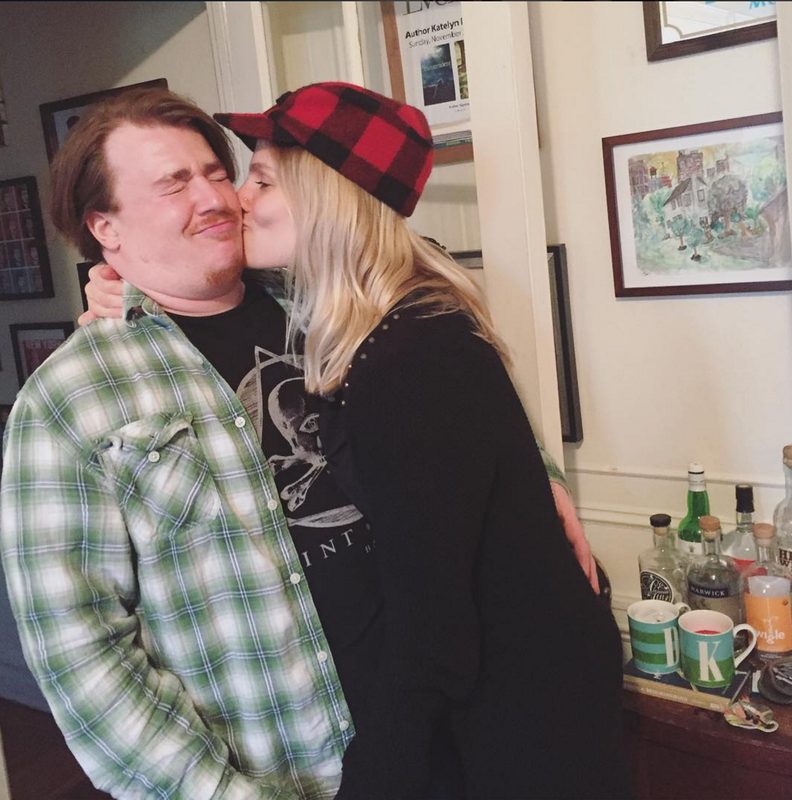 A huge congratulations are in order for '90s Nickelodeon star Danny Tamberelli and his fiancée, Katelyn Detweiler, who have announced that they'll be getting married next Spring! 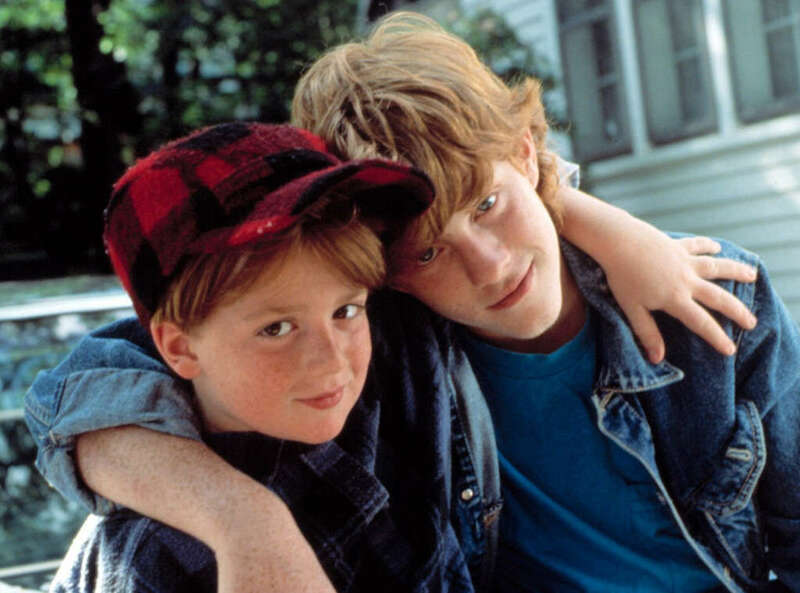 New Jersey native Danny (35), the star of '90s Nickelodeon favorites The Adventures of Pete & Pete, All That and Figure It Out, as well as '90s Nick UK favorite The Magic School Bus, and a performer in in three bands - Jounce, Undone Sweaters and Middle Blue - will wed literary agent and "Immaculate" & "Transcendent" author Katelyn Detweiler, a Marlborough Township native and graduate of Upper Perkiomen Valley High School, on Saturday 5th 2018. They will tie the knot in front of 250 guests in an old steel factory in Pennsylvania, where the bride grew up. Mike Maronna [Big Pete] will also be a groomsman at the wedding! in The Adventures of Pete and Pete. It's not clear where the two plan to hold the ceremony, but the odds-on favorites would appear to be either Phoenixville Foundry or the SteelStacks in Bethlehem. The couple, who live together in Brooklyn, New York, recently sat down with Page Six to spill all the details on their relationship and the upcoming nuptials! Katelyn: Well, we were swiping on Tinder in September 2014. Danny: When Tinder was the only thing around. Katelyn: Bumble wasn’t hot yet, so it was like Tinder or bust and I saw this person that looked familiar, but he didn’t have any write-up under it. Usually, if a guy didn’t have any [bio], I thought that was sketchy and I would swipe left, but I recognized that face. I was curious and it was just the curiosity of, “Would he swipe right on me? Would we match?” And then we did, but then I thought, “I can’t message him first. I’ll feel creepy since there isn’t anything to go off in the bio.” I waited for him. Did you think his profile was fake? Katelyn: There were some pictures that felt more personal … but honestly, no. Danny: Yeah, I had some pictures of me with my friends, like a likable guy, and me on-stage playing in a band. Danny: And then me showing up 30 minutes late to our first date probably enforced that a little bit. Katelyn: I was texting [friends] while I was sitting there debating whether to stay or not and I did. Katelyn: Sharlene’s, a bar on Flatbush in Brooklyn. Very fancy first date. Katelyn: And you wouldn’t want to spend $15 on a cocktail in case you hated me. Danny: Well, I guess that’s true too. When did you first realize you were in love? Danny: I realized pretty early on that there was something really special. Kate and I have this really warped sense of humor and I don’t think anyone I’ve ever dated in my life has truly gotten or understood the weirdness and Kate is just as weird. It’s the best. There’s something to be said about that. I just knew this was something I’ve never experienced before. This is love. It was in December 2014, around Christmas. Katelyn: Yeah, he said it in my childhood bedroom, Christmas weekend after going to my 10-year high school reunion, which, in hindsigh, was bold that I took him to that after three months of dating, but it was great. I was watching him there and that was when I was like, “I hope he says it soon.” He had been, like, with his finger, writing, “I love you” on my back and on my arm and whenever I would say, “What are you writing?” he wouldn’t say. He did say “I heart you” once. Danny: Oh, boy. That’s something you don’t want to hear a 33-year-old say in real life. Danny: I put my phone in my pocket and I was going to video me proposing to her, get her point of view of it, but it was so cold on the beach that it juiced my battery and my phone died. I was like, “Aw, man! This is never going to work. Oh, I’ll ask her to take a video.” Usually when I ask her to take a video, I do something stupid to capture the stupidity for me for later. So she thought I was maybe going to jump in the water. I asked her if she was recording and I made a fake-out move to do something and I just came right back and got down on one knee in the snow and popped out the ring. Katelyn: We went back to the Airbnb, drank some scotch, called our moms and families and then went to Shagwong [a bar in Montauk]. Is Mike Maronna [Big Pete] a groomsman? Danny: Yes, Mike is a groomsman. He will definitely be in my wedding. I [asked him] on our podcast [The Adventures of Danny and Mike]. We were just talking about it when I came back from Montauk. The producer, Jeremy, is also in the wedding, so I just asked them both at the same time. Mike was very happy, which I thought was cool. I’ve known him since I was 7 years old and he’s one of my oldest friends. 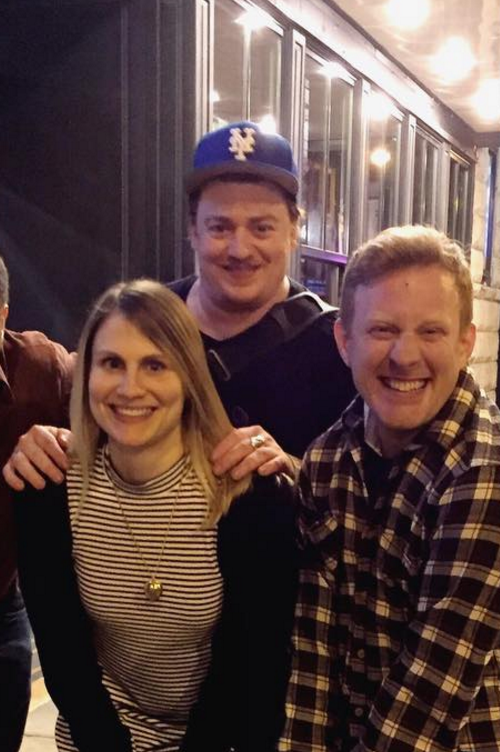 Are any of the “All That” cast members coming to the wedding? Danny: We’ll see. They’re on the A-list. I mean it’s on a Saturday and Kenan [Thompson] might be shooting Saturday Night Live at that point, but he’s got the date now. Josh Server will come from California for sure. Where are you doing your honeymoon? Danny: We’re looking at Portugal and Spain. Katelyn: I said Italy, but he’s been there too many times. Danny: I’m Irish and Italian and I’ve been to both of those countries just to make sure I knew where I came from. I’ve spent a lot more time in Italy than Ireland. Katelyn: I like the idea of the Azores off the coast of Portugal. I feel like they’re not super fancy and popular yet. I want to go somewhere without Zika. Somewhere with water in Europe. All that's left to do is get Polaris signed on to perform "Hey Sandy" at the reception! NickALive! has reached out to Petunia, Little Pete's tattoo, for her take on the news. Follow NickALive! on Twitter, Tumblr, Google+, via RSS, on Instagram, and/or Facebook for the latest Nickelodeon, NickSplat and The Adventures of Pete & Pete News and Highlights! Harvey Beaks: The Original Pilot (2013) from Ian Saldivar on Vimeo. Following Nickelodeon picking up the new series, the Harvey Beaks production crew remade the pilot of Harvey Beaks into the episode "Pe-choo!" (#101A), which became the shows series premiere episode. The pilot was written, directed and storyboarded by the shows creator, C.H. Greenblatt. - The Spirit of Wetbark Lake was light greenish with hints of orange in the pilot. But later, his skin color changed to light blue. - In the pilot, Harvey and Irving's last name originally was "Tweets"! More Nick: Kappa Mikey | Unseen Pilot For MTV! Additional source: Harvey Beaks! Wiki. 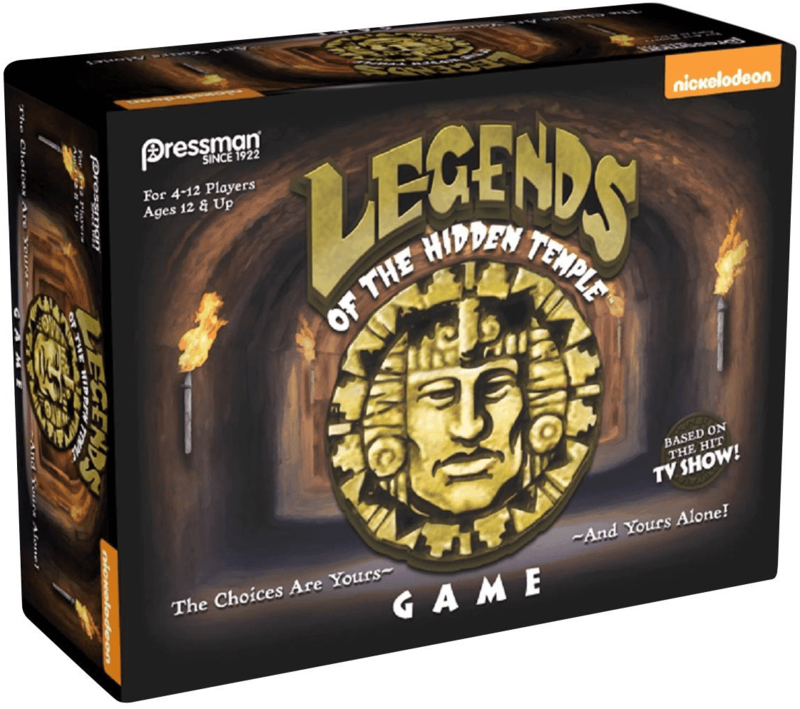 North America: Target has unveiled a score of licensed board games featuring popular ‘90s properties, including Nickelodeon's hit '90s game show Legends of the Hidden Temple! Produced by Pressman Toy Corporation, the third largest game manufacturer in the United States, the Legends of the Hidden Temple board game is available to purchase right now, exclusively at Target stores! Oh, and best of all? Target now ships to the UK! "Welcome to the Hidden Temple! Where the rooms are filled with lost treasures that are protected by mysterious Mayan Temple Guards. Only Olmec knows the legends behind the treasures in his temple. Six teams will begin their journey, but only one will earn the chance to enter the Temple and retrieve the lost treasure. But beware – to earn this privilege, you must endure tests of fortitude and intelligence, winning the Pendants of Life to protect you from the dreaded Temple Guards who are protecting the artifacts. Do you have what it takes to take on all three rounds and escape from the Temple in time? The choices are yours and yours alone! To be victorious, you must retrieve a lost treasure and successfully escape the Temple as a team or individually. With your fellow contestants, you must decide what lost treasure you seek. In round 1, the first three teams to cross the treacherous Moat twice will advance to the next round. One player from the eliminated team becomes Olmec and another eliminated player becomes the host, Kirk Fogg. Round 2 takes you to the Steps of Knowledge, where you will undergo various mental challenges. Be one of the first two teams to answer two questions correctly. Listen carefully as the Olmec reads the legend aloud for clues, as correct answers are the only way to earn a chance to enter Olmec’s Temple. Your strength and speed will be tested in round 3: The Temple Games. Compete to earn Pendants of Life in three rigorous challenges, including the Golden Cup of Belshazzar, Galileo’s Cannonball, and The Smashed Printing Plate of Frederick Douglass. If you make it through all three and earn the most Pendants of Life, you may finally enter the Temple! Alas, round 4: The Temple Run! You must race through the Temple, retrieve the lost treasure, and escape. Your time begins as soon as Olmec lowers his gate. Watch out for the Temple Guards and be mindful of the clock, for you only have three minutes to complete your mission – or you will be trapped in the Temple forever. Are you brave enough to uncover the legends of the Hidden Temple?" - And 16 Locked Door Tokens. A closer look at Target and Pressman's LOTHT board game, including photos of the game pieces, can be found on BuzzerBlog. Legends of the Hidden Temple is one of more than 70 exclusive games showcasing popular ‘90s properties that the retailer will be rolling out this summer and fall. Additional game highlights include: Bob Ross Art of Chill, Where in the World is Carmen Sandiego Card Game, Saved by the Bell Game, The Oregon Trail Hunt for Food Card Game and Super Mario Bros. Power Up Card Game. More Nick: IDW Games And Nickelodeon Partner For '90s Nickelodeon Tabletop Games | NickSplat | SDCC! Original source: License! Global; Additional sources: Wikipedia, Target Corporate. Follow NickALive! on Twitter, Tumblr, Google+, via RSS, on Instagram, and/or Facebook for the latest Summer on Nickelodeon, NickSplat and Legends of the Hidden Temple News and Highlights! "Liv & Maddie" Showrunners To Work On New Nickelodeon Show "Knight Squad"! 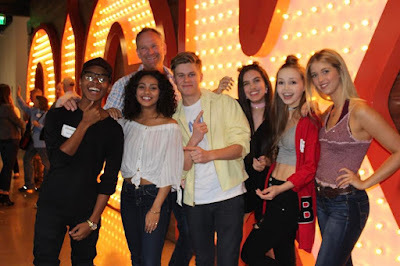 John D. Beck and Ron Hart, who have both served as producers on popular sitcoms such as Shake It Up!, According to Jim and Liv and Maddie, will be working on Nickelodeon’s upcoming brand-new live-action comedy series, Knight Squad! Knight Squad is set at a magical school for knights in training, where two mismatched students form an unlikely alliance to protect each other’s secret and pursue their dreams. “So excited to start working on the new @Nickelodeon series #KnightSquad! It’s gonna be a blast!” John announced on Twitter today, explaining that it’s basically a reunion for him and Ron on the staff. “@scatter & I have been friends w/ @MarcDworkin & @seanWcunningham for years since #PairOfKings due to a mutual love of pelicans #KnightSquad,” he shared. Picked up for an initial 20 episodes, Knight Squad is created and executive produced by Sean Cunningham & Marc Dworkin, executive producers of The Thundermans. The new series is slated to begin production this fall in Los Angeles. There's a Saturday Night Binge Party in the Turtle Lair! Plus we discover what real fake news really is, a Foot Soldier takes a lunch break, Splinter spits wisdom from inside a cage, the triumphant return of Ace Duck, Shredder has mama drama, and Donny tries to defuse a bomb with a little help from his friends. TMNT: Team Up! is developed, written, directed, produced and animated by Gary Doodles and Tommy Sica (Breadwinners). Catch more Teenage Mutant Ninja Turtles on Nickelodeon and watch Turtle Powered short films on YouTube all summer long!! More Nick: Series Finale Of Teenage Mutant Ninja Turtles To Take Place 50 Years In The Future! 'Nella vs. The Wicked Wizard' Teaser | Nella the Princess Knight | Nick Jr.
Preschoolers can watch full episodes online, play games, and discover silly surprises in the free Nick Jr. App and at NickJr.com: iTunes | Google Play | Amazon. You can also download premium apps featuring your child's favorite Nick Jr. shows on iTunes, Google Play, and Amazon. More Nick: Nickelodeon USA To Premiere "Sunny Day" On Monday 21st August 2017 / Nick Jr. USA To Air First-Look At "Sunny Day" In June 2017! Follow NickALive! on Twitter, Tumblr, Google+, via RSS, on Instagram, and/or Facebook for the latest Nickelodeon Preschool, Nick Jr. and Nella the Princess Knight News and Highlights! Look at those muscles on Dog! Too bad Cat can't bulk up like that. Clip from CatDog episode "Pumped". More Nick: SDCC 'Hey Arnold: The Jungle Movie' Sneak Peek | The Legend of Arnold | Nickelodeon! More Nick: NickSplat To Celebrate SNICK's 25th Anniversary In August 2017 | #SNICK25! Follow NickALive! on Twitter, Tumblr, Google+, via RSS, on Instagram, and/or Facebook for the latest Summer on Nickelodeon and NickSplat News and Highlights! Jack and Kira take on the Nick Likes Summer 'Cup Blowing Challenge'. How hard could it be? More Nick: Catch your favourite Nickelodeon stars in "Nick Likes Summer", all this summer, only on Nickelodeon UK & Ireland! Follow NickALive! on Twitter, Tumblr, Google+, via RSS, on Instagram, and/or Facebook for all the latest Summer on Nickelodeon UK and The Thundermans News and Highlights! Featuring the UK voice cast of Rusty Rivets. Watch more Rusty Rivets on Nick Jr.! For more Nick Jr. activities and games visit NickJr.co.uk! More Nick: PAW Patrol Live! "Race to the Rescue" To Tour The UK & Ireland During Summer 2017! Follow NickALive! on Twitter, Tumblr, Google+, via RSS, on Instagram, and/or Facebook for the latest Nick Jr. UK & Ireland and Nickelodeon Preschool News and Highlights! Power Rangers en Español de España | Dino Charge - Rangers competitivos! ¡Crece la tensión entre el ranger rojo y el doroado sobre quién es el mejor guerrero! Aumenta a tensão entre o Ranger Vermelho e o Ranger Dourado para saber quem é o melhor guerreiro. Power Rangers en Español | Dino Charge - Rangers competitivos! More Nick: Nickelodeon USA To Premiere More New Episodes Of "Power Rangers Ninja Steel" From Saturday 12th August 2017! Catch up with the first half of the brand-new season of Power Rangers, Power Rangers Ninja Steel, on nick.com/ninjasteel! More Power Rangers: First Look At "Power Rangers Super Ninja Steel" Master Mode Armor! More Nick: Lizzy Greene Performs 'Together' Wonderful Wizard of Quads Music Video | NRDD | Nickelodeon! Follow NickALive! on Twitter, Tumblr, Google+, via RSS, on Instagram, and/or Facebook for all the latest Nickelodeon and Nicky, Ricky, Dicky & Dawn News and Highlights! Scene from Nicky, Ricky, Dicky & Dawn season three episode "The Buffa-Lowdown". Follow NickALive! on Twitter, Tumblr, Google+, via RSS, on Instagram, and/or Facebook for all the latest Nickelodeon Italy and Nicky, Ricky, Dicky & Dawn News and Highlights! Desafio: pintar a parede sem derrubar uma única gota de tinta! Scene from SpongeBob SquarePants episode "Wet Painters". Follow NickALive! on Twitter, Tumblr, Google+, via RSS, on Instagram, and/or Facebook for all the latest Nickelodeon Brazil and SpongeBob SquarePants News and Highlights! -O en tu Nick Play ¡bájala ahora! Más Nick: Nickelodeon Latin America Announces Kids' Choice Awards Colombia 2017 Pre-Vote Nominees! 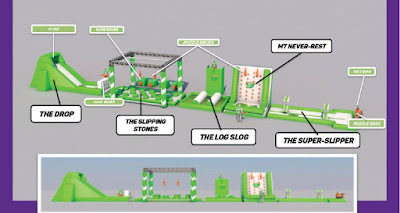 Scrambling through a sticky, slimy obstacle course earned two New South Wales teens their 15 minutes of fame with a spot on national television Friday night! 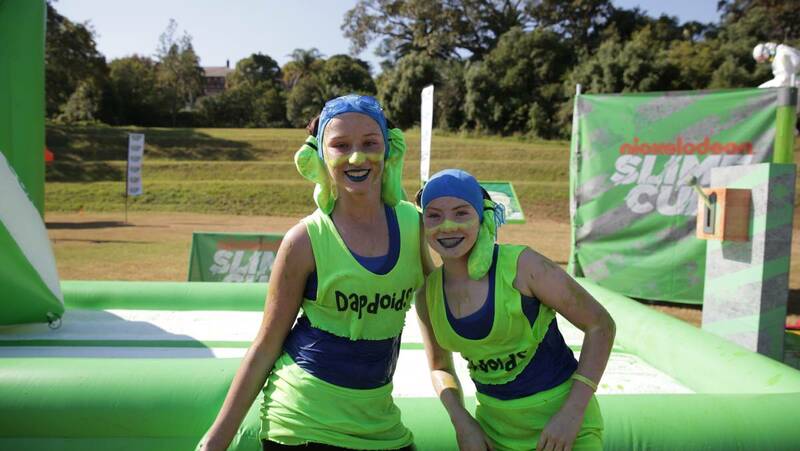 Best friends Jordyn Allan and Alysha Paul, both aged 13 and from Dapto, NSW, didn’t think Nickelodeon Australia & New Zealand would accept their application for SLIME CUP 2017, but luckily for the girls, they did, and now they’re onto the finals! The pair, known as the Dapdoids, were one of 15 teams selected from around Australia and New Zealand, much to the surprise of their classmates and Jordyn’s mum. “It was a nerve-wracking experience,” Alysha told the Illawarra Mercury. 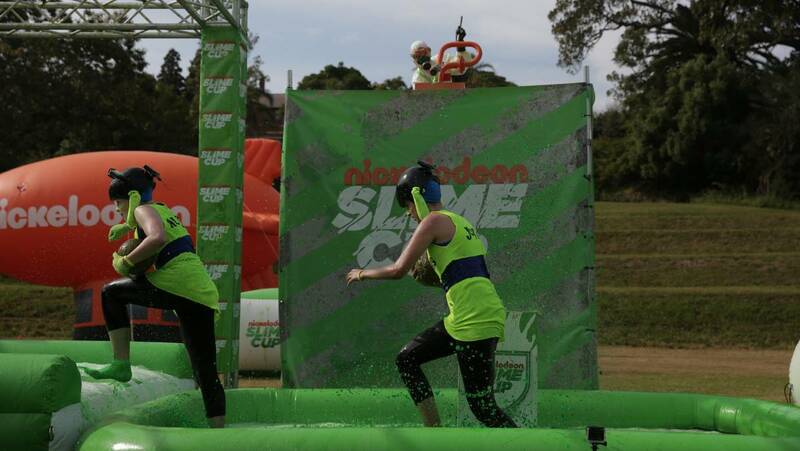 Jordan said the most embarrassing part of the sticky obstacle course was being interviewed by the host, Kristy Best. “What we were saying probably didn’t make sense and we were acting crazy,” she laughed. Both encouraged other brave young-guns to have a crack at television, Jordyn advising to “give it your all”. 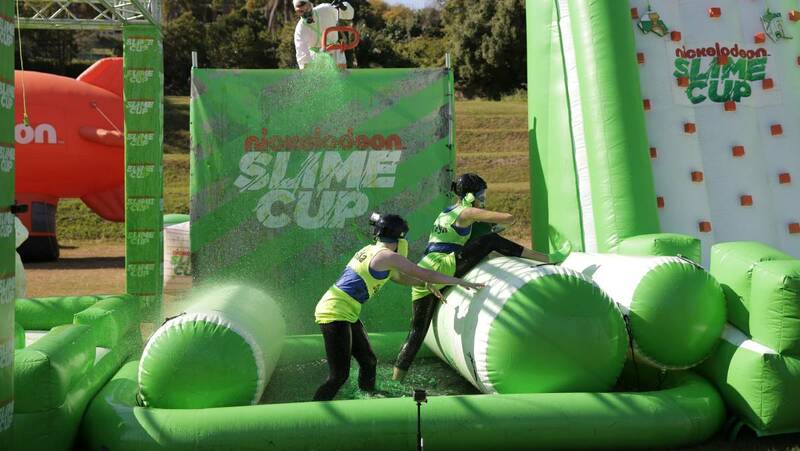 The Dapdoids will be one of five teams to tough out a new inflatable obstacle course extravaganza in the final round to win the ultimate prize, the 2017 Nickelodeon SLIME CUP trophy. 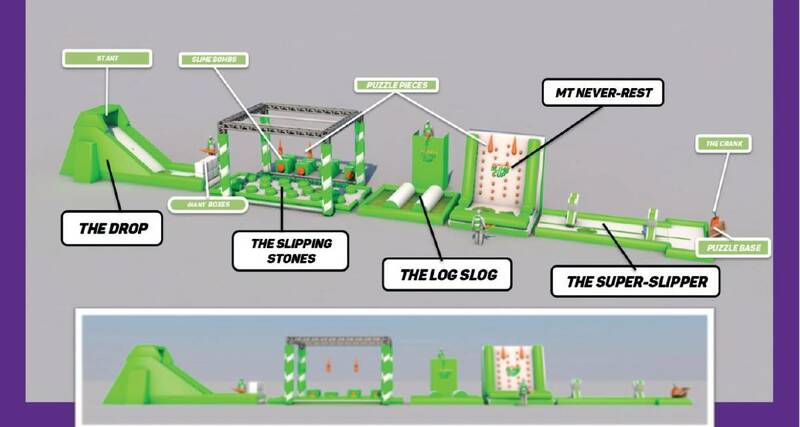 The Slime Cup obstacle course. Over the past five weeks, 15 teams of besties have tested their stamina, strength and stomachs on a series of larger-than-life inflatable challenges. Who will be walk away with the 2017 Nickelodeon SLIME CUP trophy? Tune in to season finale of the second season of SLIME CUP, premiering Friday 4th August 2017 at 5.30pm (AU) | 6:30am (NZ) on Nickelodeon! 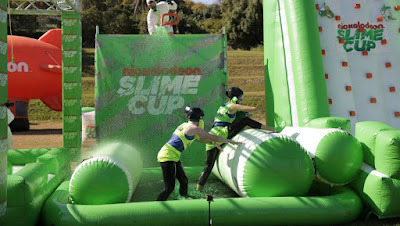 This years Nickelodeon SLIME CUP teams are (finalists in bold): Dude Doubles Lit Lads, Team Bolt, Danger Rangers; Class Clowns Cowabunga Crew, Mighty Pandas, Sponge Gods; Sista Squads Bad As Ballerinas, Purple Pukana, Split Masters; Fierce Fams Batsibs, Bendyz, Goo Monkeys; and Cray Cray Combos Dapdoid, Red Runners and The Emils. The Licensing Awards has announced the very exciting news that Nickelodeon UK & Ireland, JoJo Siwa, Teenage Mutant Ninja Turtles, Peppa Pig and Blaze and the Monster Machines have all received nominations in The UK Licensing Awards 2017! Below is a list of coveted awards that Nickelodeon has been nominated in! Post updated Tuesday 1st August 2017. The judging for the category took place at the Emirates Stadium earlier this month. Some 5,000 licensed products were entered into the awards this year and all were put on display in their relevant categories. 140 retail buyers judged the entries, individually selecting which five products they considered the best in each category. Reflecting the broad retail base of licensed products, the judging panel this year included buyers from right across the retail spectrum including Argos, Asda, Blue Diamond Group, Fat Face, Forbidden Planet, Groupon, Harrods, House of Cards, Intu, Jojo Maman Bebe, John Lewis, Laura Ashley, M&Co, Marks & Spencer, Matalan, Paultons Park, Pep & Co, Photobox, Primark, Sainsbury’s, Shop Direct, Specsavers, Stanfords, Tesco, WH Smith, Blue Inc, Character.com, Dixons Carphone Warehouse, Geek is Chic, Morrisons Nutmeg, M&Co, Blackpool Pleasure Beach, The Entertainer, Toymaster, TruffleShuffle and The Hut Group. The finalists of the UK Licensing Awards 2017's property category were decided as a result of a nomination/self-nomination process, followed by validation from industry experts. The shortlist for the Best Retailer of Preschool, Kids and Adult Licensed Products, plus the Radar Award, were decided as a result of an extensive nomination process, followed by validation by a panel of over 20 industry experts, made up of both leading licensors and licensees. The Retail Validation Panel this year was chaired by Anne Bradford, general manager of Blues Clothing. Commenting, Ian Hyder, joint Managing Director (MD) of Max Publishing, which owns and organises The Licensing Awards, said: “Licensed merchandise in all its forms is enjoying an unprecedented profile at retail, right across the retail landscape, from grocers to specialists, department stores to online operators. The six nominees for this year’s LIMA UK Rising Star Award have been revealed. LIMA UK md Kelvyn Gardner said that the increase of nominations this year underlines that there is a “great deal of rising talent” in licensing. “In this second year of our expanded LIMA UK Rising Star Award, we’ve seen a solid increase in submissions, and in the quality of the submission documents,” Kelvyn Gardner, LIMA UK md told The Source. “It’s clear we have a great deal of rising talent in licensing, and the male/female split continues to demonstrate what an equal opportunities business we are in. Congratulations and good luck to Nickelodeon, JoJo Siwa, Spin Master, Entertainment One (eOne) and everyone nominated in The Licensing Awards 2017! A full list of UK Licensing Awards 2017 finalists can be found here on Licensing Source! The Licensing Awards have really become accolades to strive for, their integrity is unquestioned as an endorsement of excellence. And the Awards event itself in The Great Room at The Grosvenor House Hotel in London, really will be an extravaganza that befits the dynamism of the industry. In 2014 over 1400 licensors, licensees and retailers attended a truly exciting awards evening that the licensing industry can be really proud of. The winners in all categories will be revealed at a glittering ceremony on Tuesday 12th September 2017, held in The Great Room of The Grosvenor House Hotel, London. The headline sponsor of The Licensing Awards 2017 is Brand Licensing Europe and the awards are officially supported by LIMA. Nickelodeon Consumer Products UK will sponsor the Best Licensed Preschool Apparel Range (0-5 years) award in the Best Licensed Products category of the awards. You can keep up to date with everything to do with The Licensing Awards on Twitter – simply follow @LicensingAwards on Twitter and don’t forget to use #LicensingAwards 17 in your tweets. Over 1,400 retailers, licensees and industry suppliers are set to attend this year’s big event. Following the awards, the party will continue with the After Bar Bar at Groovy Wonderland, backed by PowerStation Studios. Tickets are available from Createvents on 01183 340085 or email clare@createvents.co.uk. More information about the The Licensing Awards can be found on thelicensingawards. To celebrate Nickelodeon USA starting to premiere and show Mysticons, a brand-new animated series about four unexpected heroes who transform into legendary warriors to save the world, weekdays at 4:00pm ET/PT from Monday 28th August 2017, Nick.com has unveiled the networks official Mysticons show website, nick.com/mysticons! A great adventure is coming to Nickelodeon this August, as four warriors are chosen to undertake an epic quest to protect their world from the forces of evil! In the fantastical world of Gemina, four girls from completely different walks of life are brought together by fate and unexpectedly transformed into legendary warriors known as - the Mysticons! Princess Arkayna Goodfey is a confident leader who watched her king and queen parents fall under the curse of Baron Dreadbane. She and her friend Emerald Goldenbraid reluctantly team up with street orphans Zarya Moonwolf and Piper Willowbrook. Now that they're banded together as the Mysticons, they must learn to master their new powers and work together to save their realm from the return of the evil queen Necrafa! With real relationships, distinct personalities and already strong, confident, smart, witty, and funny characters, Mysticons focuses on the representation of girls’ strength, power, and courage on the television screen. Nick USA's brand-new official Mysticons website currently features information about Nickelodeon's all-new animated series and a super sneak-peek from the first-episode, "Sisters in Arms"! In the fantastic first-look, titled "Griffon Training", it's time to learn how to ride a Griffon! Arkayna and her brother are learning how to fly these cool creatures! The half-hour animated Girls Action series is aimed towards girls aged 6+ is produced by Nelvana Limited, with Steven A. Cohen and Noel Bright executive producing for The Topps Company and Scott Dyer and Irene Weibel executive producing for Nelvana. Veteran kids series writer Sean Jara is Creator, Writer and Executive Story Editor for the series (previous writing credits include Ben 10, RedaKai, Hot Wheels: Battle Force 5, Johnny Test, League of Super Evil). Mysticons season one consists of 40 episodes. In anticipation of the upcoming broadcast premiere, the Mysticons YouTube channel and social pages, including Facebook, Twitter and Instagram, are now live, with a website to launch shortly. Fans can now catch a sneak preview of the series online before the official television premiere on Nickelodeon in the U.S. and on Corus’ YTV network in Canada this August. The expansive online presence is part of a larger social and digital media content strategy involving more than 80 pieces of short-form original content supporting the brand, including introductions to stories and settings in the Mysticons world, DIY videos how to transform into a Mysticon, and more live-action content that will be available to fans throughout the season. In addition, web games and an adventure role-playing app-based game will launch this fall. Playmates Toys, the innovative toy company behind the monumental success of Teenage Mutant Ninja Turtles, will act as the global master toy partner for Mysticons. Dark Horse Comics will produce a series of graphic novels based on the show, with the first novel set to be released late summer 2018. Nelvana Studio is actively developing the franchise, and is working closely with the core group of partners including The Topps Company, which was acquired by Michael Eisner's Tornante Company and Madison Dearborn Partners in 2007. Following the shows launch on Nick USA, Mysticons will debut on YTV in Canada during Fall 2017. 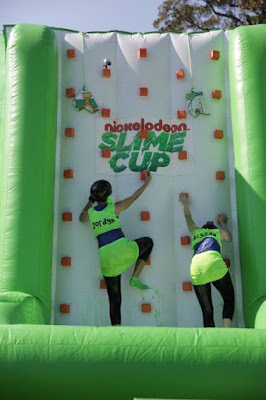 Nickelodeon serves as the global broadcast partner, including in the USA. Additional broadcast details to be announced at a later date. Follow NickALive! on Twitter, Tumblr, Google+, via RSS, on Instagram, and/or Facebook for all the latest Nickelodeon and Mysticons News and Highlights! Jeremy mostra o seu lado guloso! We love Hudson! Leer hier hoe jij net zoals Hudson kunt zijn! Spongebob e Patrick fanno arrabbiare Sandy! Shimmer et Shine sont emprisonnées par Zeta dans un flacon magique. Mais en faisant un petit geste, Leah devrait bien parvenir à résoudre le problème. Bob part explorer la zone des objets perdus du Crabe Croustillant, qui s'annonce d'une taille renversante. Nail-polish has a wonderful way of brightening up everyone’s day, doesn’t it? In this video, Kaylen tests out some really cool nail polish hacks, and shows you the different uses for nail polish, besides your nails, of course. All hacks are approved by Kaylen, and Kaylen only. Step 1: Take your clear nail polish, and coat the floppy hinge of your sunglasses. Step 3: Load the colourful staples in the stapler and staple a piece of paper. Step 1: Put the water bottles on opposite ends of the table. Step 2: Use the clothes pins to attach the earbuds to the top of the water bottles. Step 3: Use the colourful nail polish to paint any design you want on the earbuds cord. More Nick: Nickelodeon At Comic-Con International: San Diego 2017 Wrap Up Round-Up - All The News & Trailers From SDCC 2017! Follow NickALive! on Twitter, Tumblr, Google+, via RSS, on Instagram, and/or Facebook for the latest Nickelodeon at SDCC 2017 News and Highlights! More Nick: The Brooklyn Cyclones Unveil Doug Funnie Jerseys And Bobbleheads For '90s Nickelodeon Night! Follow NickALive! on Twitter, Tumblr, Google+, via RSS, on Instagram, and/or Facebook for the latest Nickelodeon and NickSplat News and Highlights! Want to be just like Dude Perfect? Check out this how-to video to be more like your favorite trick-nailing, celebration-dancing, fun-loving guys! Catch brand new episodes of The Dude Perfect Show Saturdays at 9:00pm on Nickelodeon USA! More Nick: Nickelodeon USA's August 2017 Premiere Highlights! Follow NickALive! on Twitter, Tumblr, Google+, via RSS, on Instagram, and/or Facebook for the latest Nickelodeon and The Dude Perfect Show News and Highlights! Dawn (Lizzy Greene) has to make a tough choice. She desperately wants to be Dorothy, but is it worth putting herself before her brothers Nicky (Aidan Gallagher), Ricky (Casey Simpson), and Dicky (Mace Coronel)? Only one way to decide — with an Oz-some song! More Nick: Wonderful Wizard of Quads ‘I'm Dorothy’ Music Video (ft. Lizzy Greene & Jade Pettyjohn) | NRDD | Nickelodeon! Leah, Shimmer, and Shine discover a magical gem that makes two of everything. Watch more Hunter Street on Nickelodeon, and check out nick.co.uk/hunterstreet for Hunter Street videos, games, photos and more! Follow NickALive! on Twitter, Tumblr, Google+, via RSS, on Instagram, and/or Facebook for all the latest Nickelodeon UK and Hunter Street News and Highlights! Power Rangers | Megaforce Heroics! Watch the Megaforce Ranger's most heroic moments! Power Rangers auf Deutsch | Megaforce Heldentaten! Seht die heldenhaftesten Momente der Megaforce Rangers! Power Rangers en Français | Les Héros de Megaforce! Regarde les moments les plus héroïques des Rangers de Megaforce! Assista os momentos mais heroicos dos Megaforce Rangers. Power Rangers en Español de España | ¡Héroes Megaforce! ¡Mira los momentos más heroicos de los Megaforce Rangers! Power Rangers en Español | ¡Héroes Megaforce! Así fueron los primeros días de grabación de Stefano Ollivier, Max en Vikki RPM. ¿Qué crees que es lo que más amarás de al serie? Follow NickALive! on Twitter, Tumblr, Google+, via RSS, on Instagram, and/or Facebook for the latest Nickelodeon Latin America and Vikki RPM News and Highlights! More Nick: JoJo Siwa To Perform For The First-Ever Time In The UK Exclusively At Nickelodeon UK's SLIMEFEST 2017! Follow NickALive! on Twitter, Tumblr, Google+, via RSS, on Instagram, and/or Facebook for all the latest Nickelodeon UK News and Highlights! 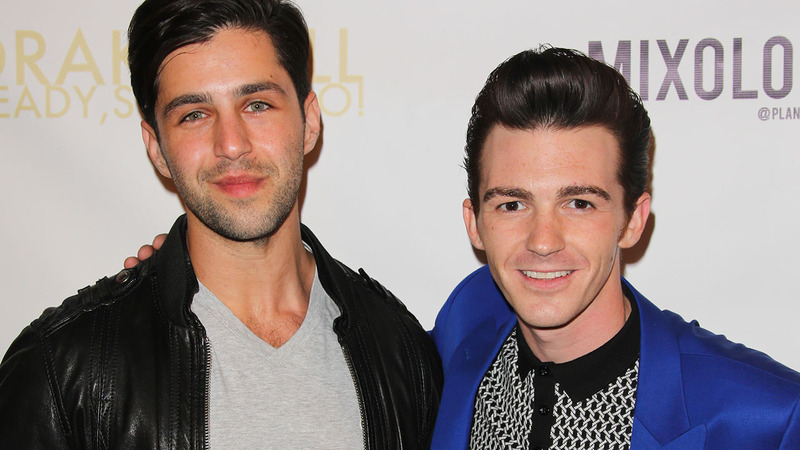 It's all good between Drake Bell and Josh Peck. The 31-year-old actor told ET's Sophie Schillaci on Friday during a Facebook Live that he and his former Drake & Josh co-star are on good terms again after the wedding drama. Bell made headlines last month when he tweeted that he was not invited to Peck's wedding, writing in since-deleted tweets that "the message is clear….Loyalty is key… ALWAYS remember where you came from." "We've been together 18 years, Josh and me, me and Josh," Bell explained to ET. 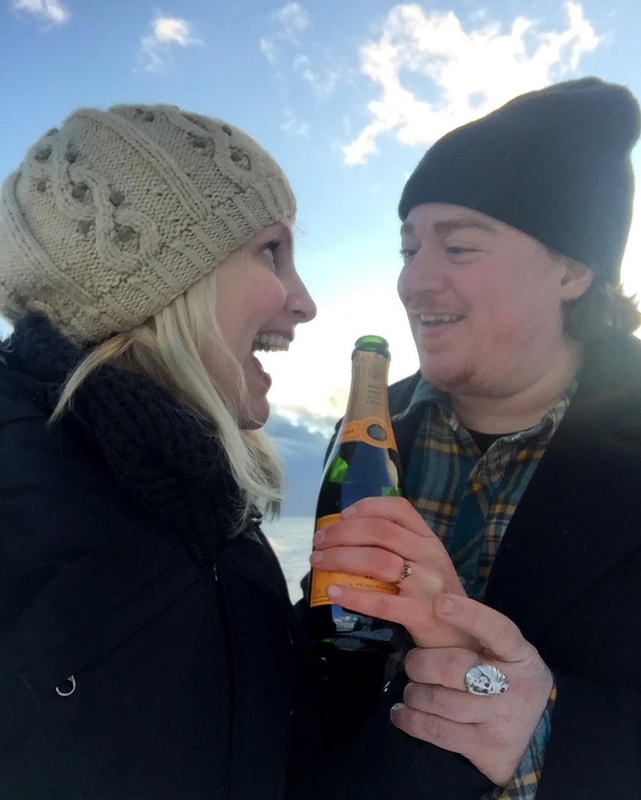 "We've been so close, it was just one of those things where you know, I'd been talking to him, and he's been telling me about the engagement. And then I saw on social media, the wedding, and I didn't hear about it. So, it was just one of those things where it was just like, 'You didn't even tell me?! I had to find out on social media?' And then you're like, 'You know what!? Fine!' and then I'm like, wait, I probably shouldn't have done that." "Yeah, I said the ties are cut or whatever, but I should have just texted that to him, you know," he continued. "I was just being cranky." "You know, it's like sibling rivalry for a minute," Bell added. "But no, I mean we've gone through every up and down that you can think of that two guys can go through. I mean, we've done our 18 hour days on set and it's, 'What are you doing afterwards? '…'Going to your house and watching movies and playing video games,' even though we've spent all day together. And then there's other times where I'm only speaking dialogue to him. You know? It's like, 'Nope, sorry, I don't wanna talk, I don't wanna.' It's just what brothers go through, what best friends [go through] and it's the yin and yang of brotherly love." As far as how much media attention the tweets received, Bell revealed that he was "shocked." "I couldn't believe it! I mean, what a slow news day!" I was like, 'Trump, can't you tweet something?! Please! Like, just do something to get the attention off of this!'" he joked. "But yeah, I was really surprised and what I was more surprised at how the fans went after Josh. That bummed me out because I was reading the comments and thinking, 'Wait a minute, you know, I can say it but you can't!' I was like wanting to defend Josh, be like 'Whoa, easy guys, easy. This is between us.'" The two have since talked and cleared things up. "It is what it is dude. I love the kid," the former Nickelodeon star expressed. "I would work with him until I'm 80 years, you know. I wanna make Grumpy Old Men with the guy. I wanna make The Odd Couple when we're old, you know? So no hard feelings, It's just when you've been so close to somebody for so long, I mean, there's just certain things that you know, 'Hey why'd you do that? C'mon man.'" 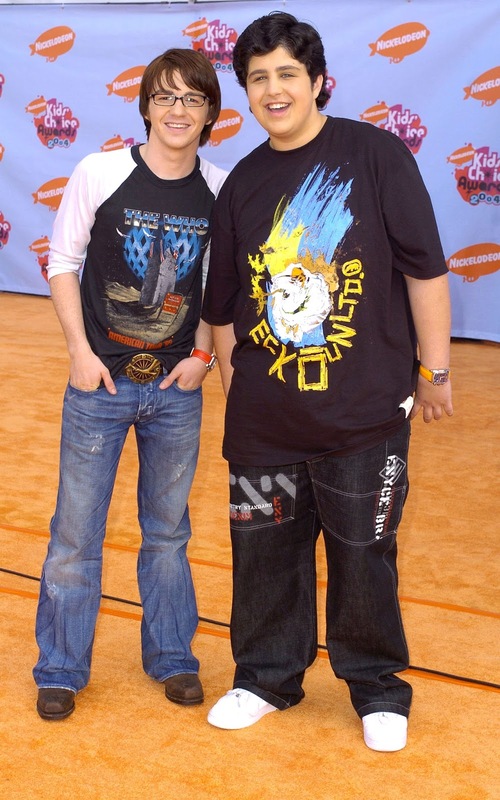 So can we expect a Drake & Josh reunion anytime soon? "You gotta talk to Peck, you gotta talk to Josh," Bell responded. "I would love to do it. I would love to. I mean, I always say in this situation, I'm the John Lennon of the Beatles. If there's time, if it's in our schedules and it's right, I would jump in it in a second. Because … there's actors that I've done TV shows with, movies with, another TV show with, a pilot with, and still don't have the connection that I have with Josh, you know? The chemistry … and what I have with Josh is so unattainable in this business." For now, Bell is focusing on his music career and his latest single, "Honest." He also has two films, American Satan and Cover Versions, in the works. For more on Bell, make sure to subscribe to his official YouTube channel! 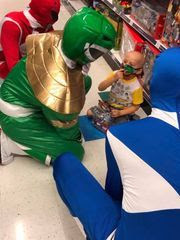 The Power Rangers are always up for saving the world, but they also have the power to bring joy to fans, and they did just that with a young fan named Grayson! Grayson Dodd is 3 years old and sadly is dealing with AML Leukemia. 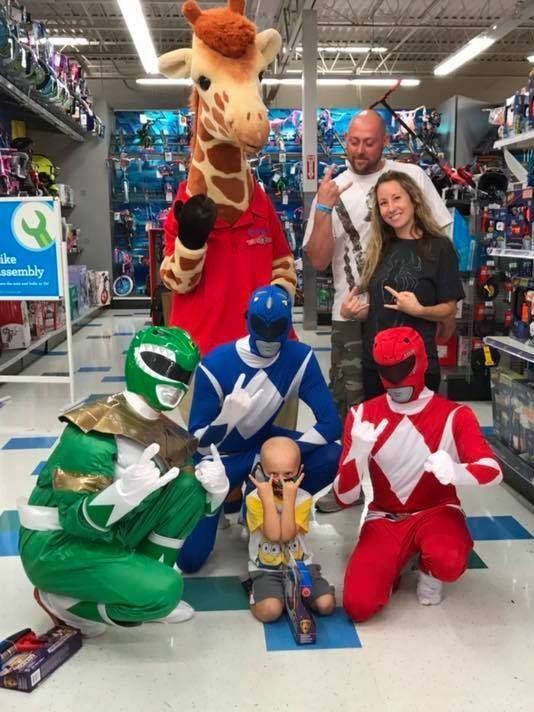 A charity called the Foundation for Strength decided to make his day by teaming up with the Westland Toys 'R' Us and the Power Rangers to give him a shopping spree, allowing Grayson to shop in the store before it opened up for business! You can view a photo of Grayson with his parents Kevin and April, the Power Rangers, and Geoffrey the Giraffe. Grayson Dodd, 3, during a shopping trip at the Westland Toys R Us. His parents Kevin and April Dodd joined him. According to Foundation for Strength's Cory Allen though, Grayson was so enamored with the Power Rangers, who are his favorite heroes, by the way, that shopping wasn't even a priority. "Grayson had so much fun with the Power Rangers that he wasn't even concerned with shopping for toys. He was finally back to being a fun lovely kid again, playing tag, battle swords and hide and seek with the Rangers. His dad mentioned that this was the first time he has seen Grayson with this much joy in over a month." It was a welcome reprieve for Grayson, giving him a memory he will never forget. He had a full cart overflowing with toys by the end of it, including a new bicycle, which he can ride after he gets out of the hospital, where's he's undergoing chemotherapy. Grayson Dodd visits with the Power Rangers during a shopping trip to Toys R Us. The Foundation for Strength mission is to raise social consciousness and donate funds to those who are battling cancer or other life-threatening diseases. Several fundraising events will be held annually to provide financial assistance to those in need. The group also aims to raise social consciousness by speaking out about those we have lost and those who are battling cancer. For more about the Foundation for Strength, a 501(c)(3) charity, you can head to their official website, FoundationForStrength.org. Grayson's shopping spree took place just a day before he had to go back into the hospital for an extended stay of chemotherapy treatments. Power Rangers Ninja Steel, the current season of Saban's iconic Power Rangers franchise, returns with brand-new episodes Saturdays at 12:00pm ET/PT from Saturday 12th August 2017! With different clothing launches happening every single day, it can be hard to find the perfect ones. Until now, that is! Take all of my money! Nickelodeon USA recently launched Nickelodeon Style, a brand-new Instagram page that curates Nickelodeon fashion, so you can shop all of your favorite styles and live out your nostalgia style dreams all in one place! Whether you're a fan of '90s cartoon characters or today's shows, this is one page that you'll want to add to your bookmarks ASAP! 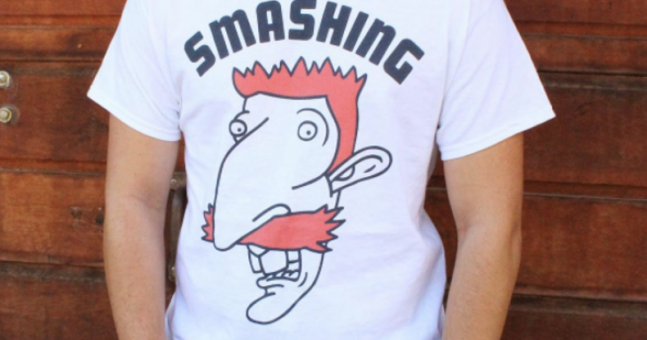 It's no secret that there are some great Nickelodeon merchandise out there. Everyone from Walmart to BoxLunch have created Nicktoons-inspired lines. What you might not know is that there's a way to find all the best items in the same place. Nickelodeon Style's Instagram page finds all the best clothing, accessories, and knick-knacks and puts them all in one place. Basically, it's ever single item that you could possibly need to finish your collection! No matter what price point you're looking to shop of how you want to do it, there's something for you on the Nickelodeon Style Instagram page. There's graphic tees from Target, beach towels from Walmart, and even Moschino. There's tons of brands in-between as well. Bottom line: it's everything that a Nickelodeon fashion lover could need and so much more! The fun doesn't stop there, though. Instead of just showing you what's out there, it gives the exact links to shop, with most products just a click away with the link in their profile! Get your wallets ready, because after seeing all these amazing items, you're going to want them all. What are you doing still reading this? Head over to the Instagram page and get to shopping, my friends! #regram from @colormecourtney 😍head to our story to see all the deets of the #Nickelodeon vending machine @thisisstory in #NYC!